Sign up TODAY to get your seller # which can be used at any JBF sale in the country. 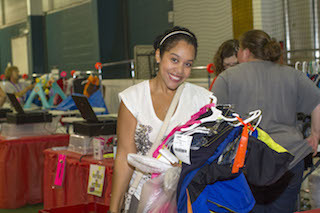 Bring your items to Body Zone, check in, grab a rolling rack and a copy of our Drop-off Map. Now you're set to put your items out on the floor! Checks are sent electronically within 10 days of the close of the sale. JBF Reading Consignors earn an average of over $350 at each sale and you can TOO! An $11.00 Consignor fee is taken out of your check, with no upfront costs to participate. Learn the tricks of the trade by watching this Consignor Workshop VIDEO. PRINT CONSIGNOR "HOW TO GUIDE"
Helping at the sale is the #1 way to increase your earnings + you shop early not once but 2x! Team Members who complete a total of 4 hours earn 70% on their sold items. Team Leaders earn 75%. Shifts are available in 2, 4 or 6 hour increments. The more shifts you complete, the earlier you get to shop! The earlier you shop, the more merchandise and bargains to be had + you EARN more...win, win! 4pm-6pm: Perfect & Power Consignors Only. Power Consignors need an appointment from 4pm-6pm today only. Power Consignors, CLICK HERE to schedule. 1. 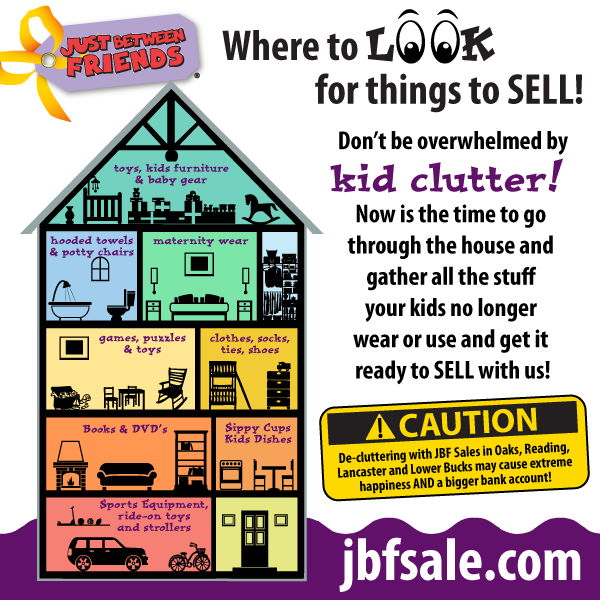 Prep, price and organize your items at home (see details below) and bring to drop off ready to be SOLD! CLICK HERE for a list of items that go in our Large Items Area. These items will need to have a Yellow Tag attached by one of our Team Members. Need a Drop-off Map to help organize your items at home? Click HERE! The Getting Started Guide contains everything you need to know. 2. Check in with your Consignor Waiver and we will provide you with a rolling rack to transport your items into the building and a map to show you where your items go. Check out our Drop off video HERE. If you are selling a car seat, booster or base, a Car Seat Waiver is also required. Here's an OVERVIEW VIDEO of what you can expect. 3. Watch your sales grow with our real-time updates. It is seriously better than winning the lottery! Consignors & Team Members shop 1st! Due to time and space constraints, we are uable to allow children under the age of 12 before Family Shop time at 7pm. The only exception is for infants who can be worn on mom or dad in a carrier. No car seat carriers or strollers before 7pm, please. Check THIS LIST to see if your item needs to have a Yellow Ticket attached and/or if your item needs to be sanitized. Be selective when selling blankets, receiving blankets, burp cloths, and towels. New and barely used items sell best. Check carefully for stains; shoppers get very disappointed if they find a stain in a bundled blanket once they get home. PLEASE NOTE, we DO NOT accept comforters, sleeping bags or bumper pads. Games and puzzles must have all pieces. No "adult" content or rated "M" video games. We are unable to accept VHS tapes. Check dvds and video games for scratches and double check to ensure the disk is in the case! Tag: When tagging books, please attach your tag to the book with clear tape or blue painter's tape that can be removed without damaging the item. Tape tag to the outside back cover. Please do not use masking or double sided tape. Hole-punch JBF tag and tie to sets. The Spring sale features spring and summer clothing only. Check out the seasonal guidelines HERE. Package & Hang: Hangers - Please hang clothes so the hanger hook points to the left (like a question mark). Hang size 0-5 clothing on child-size hangers and sizes 6-20 and maternity clothing on adult-size hangers. Refer to this guide as to where to find FREE or low cost hangers. Clothing Sets: Sets tend to sell better (under size 6) so match things up if you can. All garments should be hung with the hanger hook pointing left (hanger should resemble a question mark when looking at the front of item). Safety pin or use a tagging gun to attach clothing sets securely with bottom garment hung on the backside of the shirt, so both pieces can be viewed without separating them. Pants/Shorts - Pant-clip hangers are great but if you use a standard hanger, simply use your tagging gun to attach pants to the top part of the hanger so the garment will not slide. Onesies, socks, tights, hats and infant mittens need to be in a clear zip-lock bag (you may group multiple items in one bag). Please be sure to label your tag well so that customers know if the items are short-sleeve onesies or long-sleeve onesies. We DO NOT have a $3 rule at the JBF Reading sale. We encourage you to price your items competitively and use this guide as a resource. Exersaucers, swings, high chairs, changing tables, strollers, bath seats, baby walkers, car seats & car seat accessories must be checked for safety recalls, include all parts, and be in good condition. PLEASE NOTE, we DO NOT accept cribs. Children's furniture like beds (toddler & twin), desks, side tables, dressers, etc are a-okay! Package: If item has multiple pieces use packaging tape, zip-ties, or string to keep items attached together. If wooden furniture has loose parts, use clear plastic wrap to secure item. All furniture and equipment must be assembled during the sale. Batteries must be included, if applicable. Please bring a Car Seat Waiver for all car seats, booster seats, and car seat base or infant carrier. Make sure that shoes are clean, clean, clean! We will be VERY selective with shoes during Consignor Drop Off & Inspection. Shoes must be current SEASON (Fall = September thru April; Spring = May thru August ). Tag: Attach JBF tag directly to item with clear packaging tape or hole-punch JBF tag and tie it to item. Check out how to tag large items with multiple pieces here. If you have three or less stained, damaged, or unacceptable items pulled during the sale (and zero recalled items) you are considered a Perfect Consignor. Perfect Consignors will be given "rock star" status which enables them to enter their assigned regular presale shopping time 30 minutes early OR enter the 50% off presale 15 minutes early. AND...Perfect Consignors are able to drop off early. We appreciate those consignors who spend the extra time at home ensuring that their items are stain free and tagged correctly! If you are ready to get started TODAY, you can watch this virtual workshop by CLICKING HERE or downloading our Consignor Guide. Need Supplies? Check out our upcoming Supply Sales Schedule HERE. We won't leave you hanging! Swing by Body Zone for one of our upcoming supply sales to pick up hangers, a tagging gun and/or card stock! Supply Sales Schedule HERE. If you need children's hangers, cardstock or a tagging gun we've got you covered! See details to below to purchase a TAGGING KIT or TAGGING GUN. A Tagging Gun is totally optional and can save you time if you have lots of clothing items. 2. Review and complete the on-line Valet Waiver. A Drop Off schedule will be sent upon completion of the waiver. Spots are filled on a first come, first served basis. 3. Follow the Valet Tagging Merchandise Prep and drop off your items.